I’m giving away 1 16 oz jar of Tropical Traditions Gold Label Coconut Oil–you can enter until Friday, February 8! Remember when it snowed the other week & we had to do a quick harvest on the Chinese cabbages I’d planted this winter? Well, I just realized the other day that I’d forgotten to cook them! When life gets busy, there’s no telling what ends up in the bottom of your produce drawer–amirite? Thankfully only one or two leaves were questionably yellow, so I ended up with about 10 cups of chopped leafy greens & stems (these cabbages were similar to bok/pak choi, not like Napa cabbages). But what’s a girl to do with that much cabbage? Make a stir-fry of course. The day after I made this stir-fry, The Kitchn ran a little piece on Cara Cara oranges–what are they, what do I do with them? I think I’d generally agree with the ‘just eat it!’ sentiment, but given the cold & given my desire to eat more citrus, I decided to run with the traditional orange sauce stir-fry (with lots of ginger mixed in for extra kick). Lately I’ve been trying to whip up more quick, weeknight meals (not usually my style, but working freelance + my full time job means it gets hectic), and this stir-fry fit the bill. It’s a simple recipe–use what you have–but the star is the sauce: orange, ginger, soy sauce, rice vinegar, a hint of Sriracha for heat. Seriously, that’s it. Serve with rice or quinoa, and you’ve got a filling, multi-night meal in under 30 minutes! 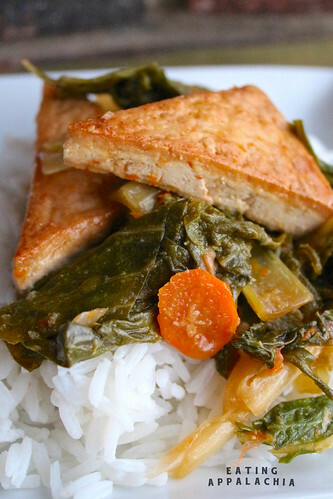 Cut the tofu into triangles (1/4″ thick) and fry in 2 tbsp coconut oil until golden on both sides. Remove from pan and set aside. In a small bowl, combine the orange juice, zest, grated ginger, soy sauce, rice vinegar, and Sriracha. Whisk to combine. In a wok, warm 2 tbsp coconut oil over medium-high heat. Add the onion and carrot and cook 3 minutes until just turning translucent. Add the Chinese cabbage, cook 2-3 minutes until just wilting. Add the fried tofu, stir, and pour in the sauce. Cook 1 minute, tossing everything to coat. I absolutely eat all the cara cara oranges by themselves before ever getting around to cooking with them. But! this tofu sounds really good. I bet the coconut oil as frying medium it amazing. Oh gosh this looks so incredible! I never remember to do anything with oranges besides cook them but I did recently have a roasted fennel and satsuma salad that was really delicious. I once put citrus in a roasted beet and avocado salad too, that was fantastic. Really, citrus can do no wrong. Mmmmm. That looks awesome. Love me some winter cabbage. I’ve been obsessing over cara caras this season, and actually bought a big bag of them yesterday. I was planning to go with the “just eat it” approach, but this just sounds so lovely I might have to discard that notion altogether! Ooh yum! I’ve been all about citrus lately, too! Maybe it’s a winter thing? Ooh I know what I’m making for my next tofu splurge! I’m pretty sure that you always have the tastiest looking tofu dishes on the interwebs. Always so crispy and enticing! Easy peasy – I make something very similar! I don’t think folks realise how simple it is to pull these citrus-based marinades together. Your tofu looks beautiful. And you could do this recipe as easily with bok choy! That looks great….. and what fun to use up your homegrown cabbages tooo…! You sauce sounds divine. One of my favorite stir fries is a spicy orange chicken and I make a sauce with molasses, orange juice & zest, hot peppers, ginger, garlic and soy. LOVE it and now I am drooling! This look like a nice simple way to prepare lots of yummy veg – and I’m a sucker for Sriracha. I haven’t cooked much with coconut oil, though, just because I never have it. I need to try it – I’m probably missing a trick by using olive oil all the time. That whole burning point thing. How did you know, cara cara oranges are my absolute favorites? Even though blood oranges may be arguably prettier, I just can’t resist the smooth sweetness of the cara cara. I just bought a whole scad of them today, on sale and prime time for stocking up. I hadn’t even considered cooking with them before, but now this stir fry is sounding like a great idea. I’ve been enjoying cara cara as a quick snack lately and I have 2 left on the counter. One of them will now be used for this recipe, it looks awesome! I almost grabbed a big bag of cara cara oranges last weekend, but I talked myself out of it. Now I am kicking myself! I love everything about this–you cannot go wrong with tofu, cabbage, and sriracha!